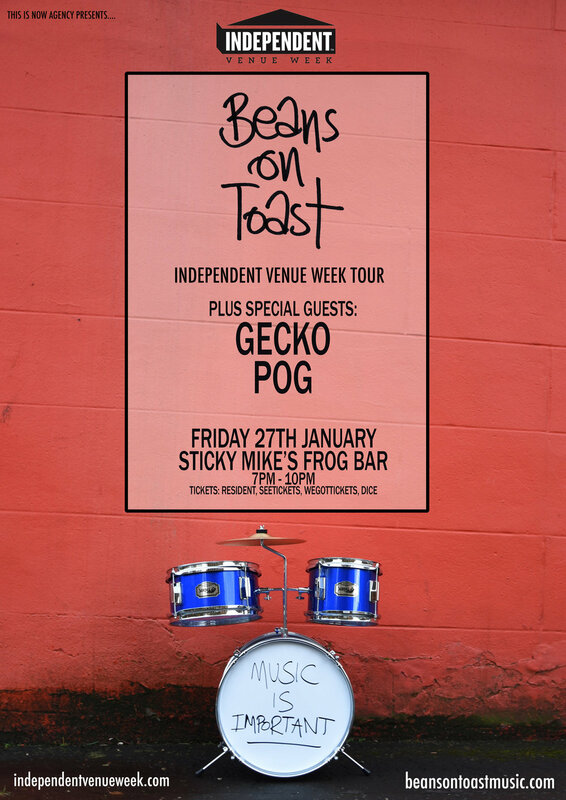 The venue was Sticky Mikes Frog bar in Brighton and the gig was in the downstairs room. I could not use the stairs so Joe, who worked at Sticky Mikes, took us to the pitch black lift next door and managed to get us downstairs he was really helpful and brought me a chair later on! It is quite a small venue with maybe a 100+ people there. The bar was accessible with accessible toilets in the downstairs venue. I wasn’t asked for ID but did have my hand stamped so they didn’t have to ask again at the bar. Although the station was a little way away I got a taxi to the front door. What were the bands like? The first band on were POG who are also playing at our fundraiser in Feb! This is how I would describe their music like loud thundery weather, eating baileys ice cream with cats dancing in the sky. The second band was a guy called Gecko he music was like calm blue sky with mad low flying bats singing love songs with smooth cherry ice-cream. The main act was BEANS ON TOAST! Unfortunately I only saw ten minutes due to the silly trains back to sty Leonard’s warrior square. However the ten minutes I saw was good. Beans on toast was noisy like a calm storm in the sea it was like eating coffee ice cream with plastic foxes jumping out of the ice-cream causing havoc. What would you give it out of 10? Why? 10/10 the staff were helpful the music was loud but not too loud and nice people and nice atmosphere! Look forward to seeing POG at our fundraiser 9th February – get tickets here………..